It is the year 1950, an alien civilization known as the Chimera have invaded and conquered much of the planet Earth, expanding their armies by capturing humans and transforming them into monster-like supersoldiers to fight on their behalf. Nathan Hale is one of the remaining human armed forces and a soldier from the United States, and with them and the British joining forces they will stop the Chimera from taking over Europe. The game progresses it's story by playing through it and by showing some cutscenes that are either still shots with expositions on them, or showing us an event or it could be both, and by playing through it, while it feels like it's slowly progresses the story, it is pretty much fine since this game does have some great moments and it can keep you interested through it and the cutscenes, while it does give you some great narration, sometimes it can be a little boring to watch, it's not bad but it could've been like the event scenes that show us what is going on by showing it through us. The game also has some lost documents that are scattered throughout the game (more on that later on...) that also gives us a description of the objects that are in the game, be it vehicles, the enemies, the weapons that you can use, etc. and it can also give you an insight into what happened, is happening, and will happen in which further expands the whole setting this game is presenting, the game could've been better with its story progression, but as a whole, the story is allright and it can get you a little interested in it. 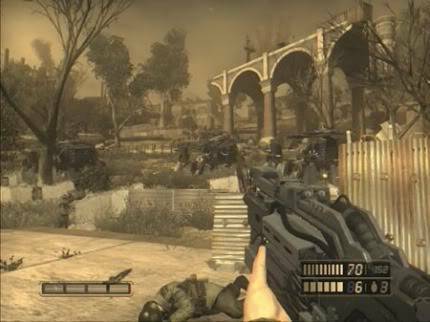 Resistance: Fall of Man is a first-person shooter that supports the SIXAXIS controller and the Dualshock 3 controller thanks through an update, the game is mostly linear where your objective is to go from point A to point B while surviving and fighting your way through the onslaught of enemies you encounter, but the game also has a few levels where it is more expansive or even shorter than the others to the point that it's just a small area, the game ranges from small to decent amount of variety when progressing through all the levels, be it riding a vehicle, or evading the trap mines, but one of the things that this game makes it stand out is the arsenal of weapons that you can use, with a mix of human and chimeran weaponry, each weapon provides a unique play style to the point that it can be strategic as well, for example a chimeran weapon called the "Bullseye" has a secondary mode that fires a marker, such that all bullets shot in the primary mode will strike the marked target for a short time, and another one is the "Auger", another chimeran weapon, where the primary fire for this weapon is simple rapid fire, but the bullets can go through walls, and they can come out stronger on the other side, increasing a whole new level of strategy but that's not all, the secondary fire creates a barrier that is resistant to all bullets but its own. The game not only is it fun, but it can also be pretty difficult as well, to the point in which you need to be strategic on how you must face the enemy and how not to lose your health and ammo, in which just barging right into the fire zone can pretty much get you killed if you're not careful, and while some people might think that it's not enough in order to be impressed to ignore the linearity that this game has, for me it's still pretty fun and pretty strategic thanks to its great innovative offerings. However one of the problems I had with this game is that there are a few moments where you can get shot, even though you are in great cover (either the enemy AI is REALLY good or taking cover in this game barely works), and your ally's AI can also sometimes be bothering you, to where one of your allies can go to the fire zone without even thinking in which he will either be killed immediately or will block you from shooting at the enemies, instead of helping you. Resistance: Fall of Man also features a multiplayer mode for up to 40 players online with a 4 player offline as well that utilizes the PlayStation Network ID (PSN) that can save your profile status online. The game's multiplayer enables you to create your own clan, create your own matches (custom games) or join pre-set games (Ranked Games) it also has an integrated friends system which allows you to add another player without becoming friends on the PSN and in the online friends list it shows your friend to be either in the lobby, staging or in a game and in here players can invite him/her to a game, invite him/her to a party or send him/her a Message. The game supports Bluetooth or USB headset for in-game chat and there's even Text chat enabled in pre-game lobbies as well. 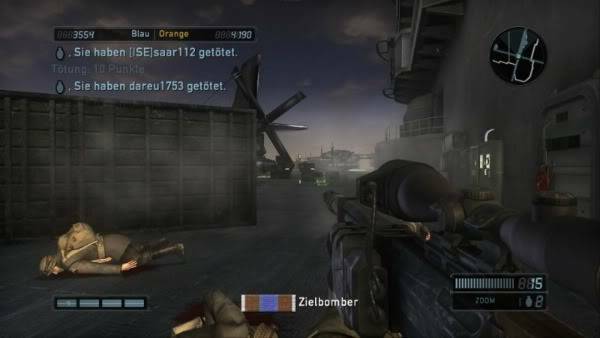 The multiplayer includes well known modes such as deathmatch, team deathmatch, capture the flag and such, but there's also meltdown, breach and assault. One of the most fun things in the multiplayer is that you can create a match and can adjust the settings of the game such as weapons that do one hit kills, health to be increased to a 200%, etc. And while the multiplayer is fun, there's a problem... there isn't a lot of people in the game, meaning that there will be very few matches to play on or there are a lot of matches but with only a few people in there. This game however also features an offline co-operative mode that allows you to play through the campaign mode with a friend, and this mode is also fun as well ! So in short, the single player is good since it's fun and also strategic, but it also has a few problems with it that might affect some people's enjoyment of the game and the multiplayer can be fun as well... as long as you find a decent amount of people in a match that you want to play. The game looks really great when talking about the depth of the atmosphere in the environment, as for the actual graphical looks around you, they look nice but sometimes you can see some of them being outdated, but I guess I can give that a break since this game was a launch title for the PS3, the lightning effects look impressive, you can almost see the technological build that was used for the lightning effects, but it still looks nice though, and one more thing to mention is that the game does lack other vibrant colors, since the game focuses on one darkish color like brown or night blue only in order to fit the setting of the game, and while I liked the whole premise of the color choice, people who want their game to have other vibrant colors and such might not like this game. The soundtrack in this game is really good, it has this epic feel in it while you're in a battle, but the game is mostly quiet and it can only play music in a certain moment in the game, mostly in a warzone moment, but the thing is, the game is mostly focused in the gameplay, meaning that you won’t pay attention to the soundtrack in the game, but if you do, it's really good ! The sounds are very mixed, some sounds are very cool and good like the sound of your weapons firing and things breaking, but some sounds are very weak like when you melee someone or the exploding grenades. The voice acting is really great, even though your character doesn't talk much, the voice of your soldiers companions do act very good and so does other key characters like Rachel Parker and Stephen Cartwright, the game also supports a variety of languages. 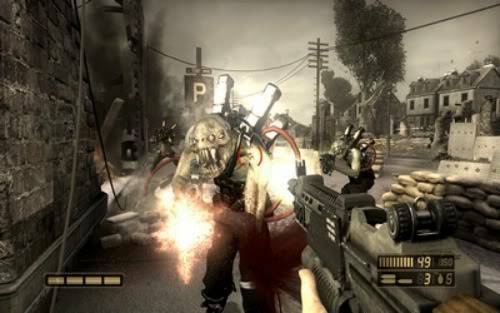 The game is set in an alternate history 1951 and the game pretty much takes place in the UK, with places like York from North Yorkshire, Grimsby from Lincolnshire, Manchester from Greater Manchester, and other places of England, it does a good job at creating this setting of an alternate history since many of its gameplay features stem from this like the whole futuristic looking alien technology, but they do look over the top and does create a setting that makes it being new and different from the real world, but there are still some sections that is just the alternate life of what would happen if there was an unforeseen invasion in England, and it does a good job at it (in fact, there was some controversy over the use of Manchester Cathedral in one level of the game...) but the most notable thing about the game's setting is obviously the weapons because some weapons are based on real weapons circa the 1950s, while some weapons are futuristically altered in accordance with the game's setting. As for the replayability, as I've said before, you can collect the hidden documents in the single player game but not only that, this game also features skill points where they can be earned throughout the single player game, kind of similar like the PS3's trophies and Xbox360's achievements, these are awarded by doing certain actions in the game that are hinted by their titles... however, the specific details are not revealed until the skill points are actually earned, so you might be busy with this concept, these skill points can be earned during any single level, but there are also skill points that are specific to certain levels of the game, and the good thing is that unlike the trophies and achievements, each task is worth a different number of points which are used to unlock additional extras of the game like Concept arts, a movie player multiplayer skins and others. And finally if you beat the game you can unlock new weapons, and you can also unlock skins in the multiplayer by reaching to a certain level and soldier medals in which you can obtain them by doing a certain task, from the look of things, you will get busy with this game for a while. I think your score is a little too generous but your review itself is a work of art. As for the game itself, I have little interest in first-person shooters, but the fact that it's strategic intrigues me. Not that other FPS games aren't, but yeah. You've been working hard today. You are a great reviewer that keeps getting better with each review. This is a great idea reviewing a few non Nintendo games.